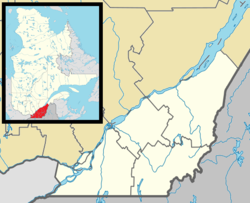 East Hereford is a municipality of about 300 people in southeastern Quebec, Canada, in Coaticook Regional County Municipality in the Estrie region. East Hereford is located just north of Beecher Falls, Vermont, and on the east side of East Hereford it is bordered by New Hampshire. Halls Stream, a south-flowing tributary of the Connecticut River, forms the eastern boundary of the municipality and the Canada–United States border. Dairy farming and lumber products are the main sources of income in the area. The nearby Mont Hereford has a developed trail network for the sport of mountain biking. ^ a b "(Code 2444010) Census Profile". 2011 census. Statistics Canada. 2012. This Estrie location article is a stub. You can help Wikipedia by expanding it. This page was last edited on 28 September 2017, at 02:16 (UTC).